RegexBuddy offers you a unique view inside a regular expression engine. When a regex doesn't do what you want when testing it, and the problem isn't obvious from the English description of the regex, simply run it through the RegexBuddy debugger. The debugger shows you each and every step of the matching process. It eliminates all guesswork as to why the regular expression matches what it does, or why it fails to match. No other tool offers this level of detail. The debugging output is produced by the exact same regex engine RegexBuddy uses to highlight matches in sample data, and to grep through files and folders. You can be 100% sure the debugger shows you exactly what is going on inside the regex engine. If you test the regular expression ". *", you will find it does not work properly. The debugger shows you why, as you can see in the screen shot. The most useful aspect of the debugger is that clicking on a regex token will highlight the text matched by that token at each step. Conversely, clicking on part of a match step shows you which token matched. Click on "backtrack" to see which token failed. This example was kept simple intentionally, so you could see the whole match attempt in a single static screen shot. It does not do the usefulness of the debugger justice, though. You will soon appreciate the debugger's unique value when working with regular expressions that consist of multiple levels of alternation or nested groups. 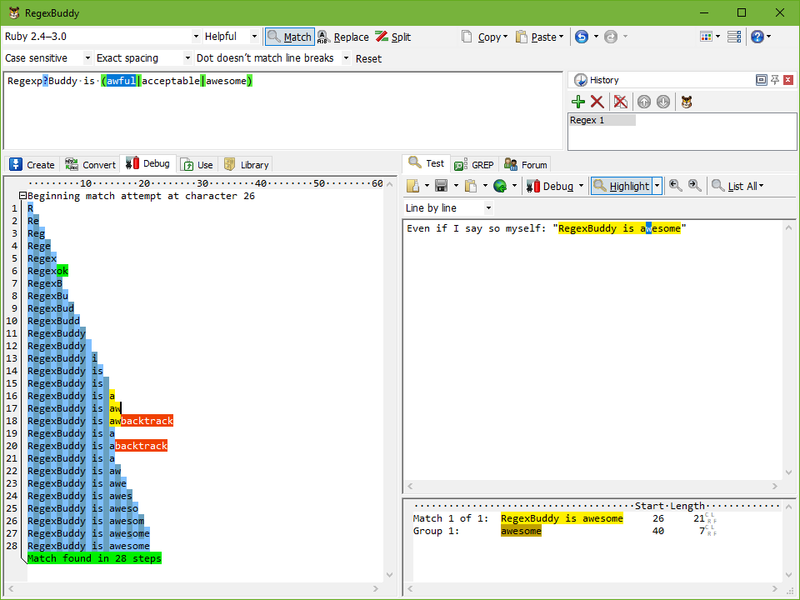 The debugger will show you plainly how different parts of a regular expression interact. Much easier to see than to describe in English or to try to figure out in your head. "I purchased RegexBuddy earlier today. Holy crap. I had no idea what I've been missing. The iteration data that RegexBuddy provides on the debug view is invaluable. Phenomenal job." "I had written some complex regular expressions which worked fine when a match was found. But when subject could not be matched it took a lot of time, up to 200ms, to return a result. "RegexBuddy's debugger quickly showed me the expression caused catastrophic backtracking and allowed to find source of the problem. The same debugger also showed me how to greatly improve performance in other expressions. "I could simply never have done this without this tool."